The secret of my beautifully fitted shirts. Traditional craftsmanship and obsessive attention to details. Fabrics, hand-stitching, trimmings: nothing is left to chance. 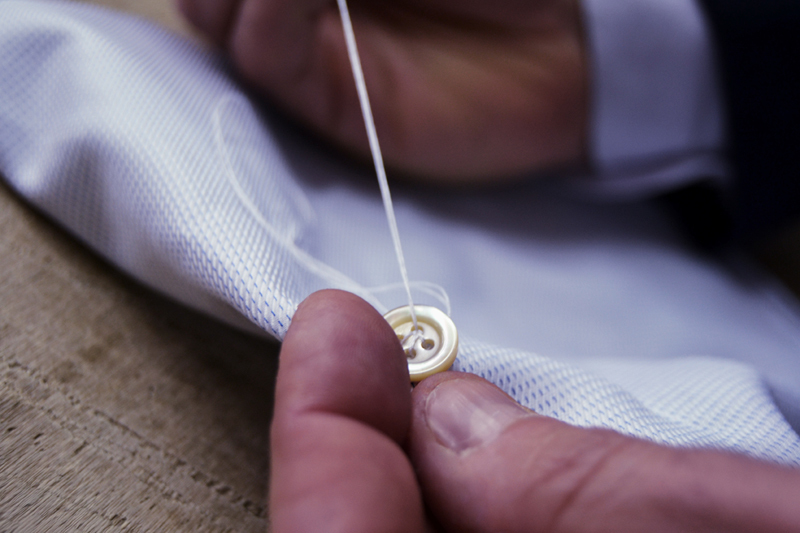 It all starts with a precise cut, and after many hours of work a bespoke shirt of unique quality is born. My bespoke shirts are unique, because each person who knocks on the door of my workshop is unique. The person is at the center of the craft: the making of each shirt starts with a talk aimed at uncovering the customer’s needs, wishes and personality. These are then translated into recommendations as to the most suitable fabric, the most flattering collar style and body cut, and all the details; this is without doubt the part of the process I enjoy the most. My bespoke shirts are handmade: this is my strength and what sets me apart from other craftsmen. I believe the difference between a shirt and a masterpiece lies in how a shirtmaker draws the pattern and cuts the fabric, and for this reason I personally cut each and every shirt, without exception. The collar interlining is drawn and cut by hand, ensuring the collar holds up well and doesn’t collapse, even when worn without a jacket or tie. I personally source the most refined fabrics from the best mills such as Sictess, Thomas Mason and Carlo Riva: cotton, linen and silk-blend yarns in a range of weights and qualities between 120/2 and the luxurious, silky180/2. After hours of hand-stitching, my shirts are ready to be delivered in a luxurious box to my discerning customers.